Last year I made a batch of this ginger liqueur (recipe adapted from here), and though at first I wasn’t sure how to use it, we eventually discovered that it makes all kinds of drinks better. It goes really well with fruity flavors, especially citrus, and it adds just a bit of spiciness. When we ran out I knew immediately I had to make some more, so I whipped up a second batch. This time I even designed and printed my own label–it’s a bit classier than Sharpie on masking tape, isn’t it? I might have to make my own labels for everything from now on. 1. Peel the ginger* and finely chop it. Split the vanilla bean in half lengthwise. 2. Bring the ginger, vanilla, sugar, and 200 mL of the water to a boil. Reduce heat to medium-low and simmer until ginger is soft—about 20 minutes. Let the syrup cool. Do not strain yet. 3. Zest the lemon and place the zest in a glass bottle along with the rest of the water, the cooled syrup, and alcohol. Seal and shake, then let this mixture steep for one day. 4. After one day, remove the vanilla bean and let the mixture steep for an additional three days. 5. Strain mixture through a fine mesh strainer into your bottle or jar for storage. Press on the ginger pulp with the back of a spoon to extract all of the liquid. Let the liqueur sit for at least one more day before using to let flavors mellow. *A great way to peel ginger is with a spoon. I was skeptical the first time I tried this, but it works really well for getting around the bumps and knobs of ginger root. Click to view and download full size. Wow! this sounds so yummy and would make a great gift, I can’t wait to make some! Thank you for sharing your awesome ideas and talents – you are truly gifted and reaping God’s blessings<3 🙂 I love your blog and creativity…keep up the good work! 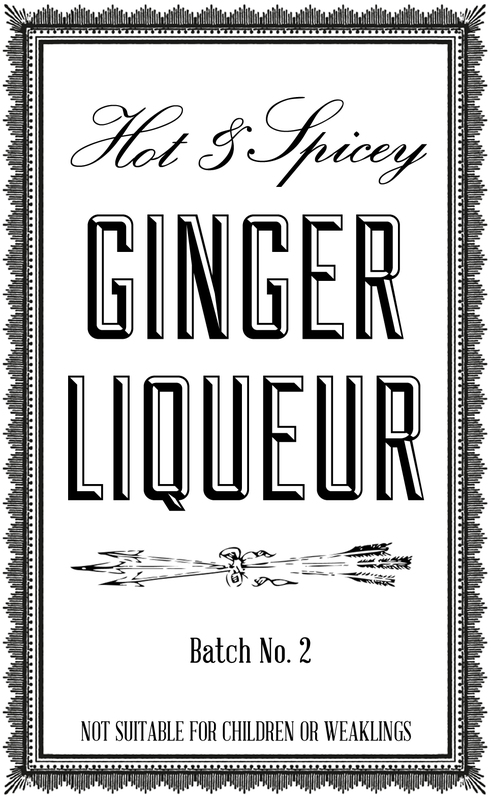 I can’t wait to try some of your ginger liqueur. I think I may need to bring some to the boat. Love your blog! Did you prefer the vodka or brandy based liqueur? Angelique, I made mine with Everclear, which is more similar to vodka than brandy. Okay. Sorry for the confusion. =) After I read, “Last year I made a batch of this ginger liqueur (recipe adapted from here)”, I thought that you had tried the recipe with brandy last year and this year you had used Everclear. Hi! Did you measure the ginger before or after chopping? Thanks! This is great, got the ingredients today, will give this a try! Where do you buy your bottles?